They say that ‘the devil is in the detail’ and frankly, there’s nothing quite like paying attention to these finer points than when you’ve got the world’s media breathing down your neck. So much works goes on behind the catwalks at Fashion Week that us mere mortals would never even consider, and it’s some of these less obvious details that are getting plenty of attention this year! What’s the first thing you notice when you enter a room, the one thing that can instantly add or detract from its appeal? Scent. Which is why we’re all supposed to be baking cookies and brewing coffee like demon baristas when it comes time to sell our homes. It’s all in the name of adding atmosphere to your surroundings and show designers are understandably, certainly up for a bit of that. Show scenting is big news this year and across the Atlantic, Victoria Beckham chose to scent her Spring/Summer 2012 presentation at New York City Library with a sea of Jo Malone Lime Basil & Mandarin and Grapefruit Candles. 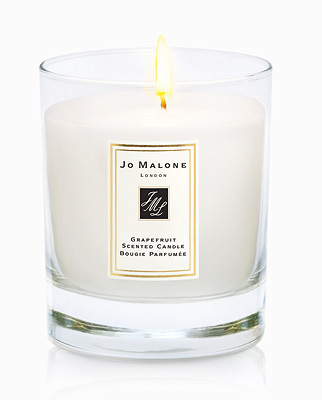 Moving closer to home, the British fragrance company will also be scenting the British Fashion Council Tents throughout London Fashion Week with Jo Malone Orange Blossom as well as Erin O’Connor’s Model Sanctuary with Jo Malone Lime Basil & Mandarin and Grapefruit. One of London’s most established fragrance houses, Penhaligon’s will also be working hard to make the capital smell delicious as they get to work with Meadham Kirchhoff to scent their Spring/Summer 2012 collection for the fifth season together. The design duo have chosen the fruity floral Artemisia as a celebration of all things feminine. Described as a tumble of green apples and nectarines, washed with jasmine tea and sprinkled with a luxurious medley of violet, cyclamen and lily petals. The scent will be used to fragrance the invitations and the venue, whilst each model will receive a liberal spritz just before heading down the catwalk. Finally, lest we forget, London Fashion Week isn’t just there for scenting, it’s for showcasing and what better place to launch a new perfume than off the back of your Spring/Summer 2012 ready-to-wear collection? Verónica Moncho Lobo launched her first fragrance Verónica last Friday alongside the showcase of her latest SS/12 collection. The fresh, floral scent employs a bouquet of jasmine and cyclamen at the heart of the perfume. The fashion designer coupled these spring and winter florals to evoke memories of her childhood in Argentina. Classic base notes of sandalwood and white musk promise to add a timeless touch to the fragrance. Do you have a favourite fragrance that you’d scent your show with? Oh man, if only Burberry’s Body was more potent, I’d get out the water sprinklers and replace the water with it. Also the description of Artemisia has piqued my interest; need to find somewhere that stocks it so I can give it a bit of a sniff. Also I could totally justify the splurge by the fact it’d look gorgeous with my schemes for a makeshift vanity. maybe being able to justify it is a bad thing, considering the prices I’m seeing pop up.